This loosely-woven, netted Dish Cloth can be used anywhere scrubbing action is needed. Washing your dishes can be a chore, but our set of two specially woven, netted Dish Cloths you can do your dishes and so much more, with ease! Great for everyday use, these non-absorbent cloths will do some heavy-duty cleaning anywhere scrubbing action without a lot of water is required. They're great for removing flour, dough and other sticky substances from countertops after baking. 45 cm x 45 cm / 17.72" x 17.72"
How did that happen? You've got stuck-on goo on your stainless steel cooktop, which is going to be hard to remove without scratching the surface or using a sopping wet cloth. It’s our convenient set of two netted Dish Cloths to the rescue! They gently scrub off any stubborn, stuck-on mess from all kinds of surfaces using only a little water. 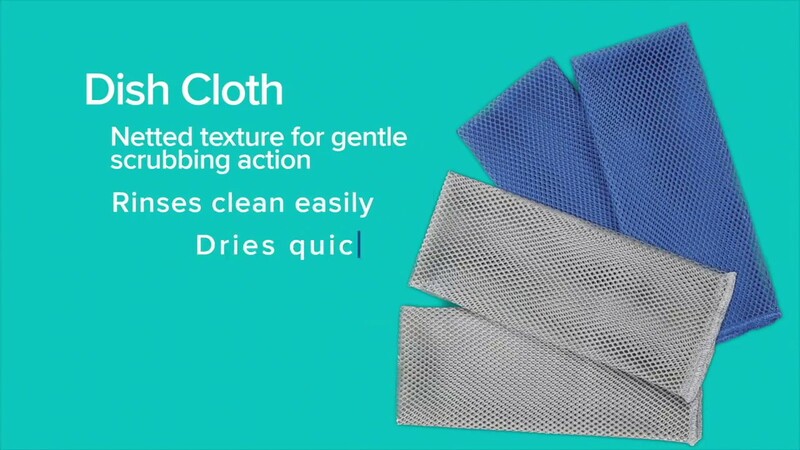 No more sopping-wet cloths or risk of scratching! Use anywhere scrubbing action is required. May scratch acrylic and delicate surfaces. Rinse thoroughly after use and hang to dry. Machine-washable. Net-like texture works wonderfully to remove caked-on food and sticky substances from dishes and counters. Loosely woven mesh reduces the ability to harbor germs, odors or food particles. One single bacteria cell can become more than 8 million cells in less than 24 hours! The number of bacteria it takes to make someone sick can range from as few as 10 to upwards of a million.